Act #338: Bring your own "normal" to this year's holiday potluck. Imagine this: An all-American, cute-as-a-button 8 year old girl with pigtails growing up in Suburban Chicago. Just like all the other kids, on Sunday afternoons, she rode her Barbie bike with pink tassels. She and her friends LOVED Wednesdays because they served tacos in the school cafeteria. Just like the other kids, her favorite show was Wonder Woman and she could jump rope for hours. But she had a secret that she never told any of her 8-year old friends at school. Each night while they all sat down to hearty dinners of Shake and Bake pork chops and meatloaf and mashed potatoes, her family sat down to heaping bowls of steamed rice and ginger chicken stir-fry, egg omelets filled with ground chicken and garlic, rice noodles with sweet soy sauce. And oh how she longed for a "normal" family dinner with buttery rolls instead of jasmine rice and scalloped potatoes instead of peppery, stir-fried cabbage. She secretly dreamed of a day that she could grow up and only eat these normal foods. Yesterday, that girl (who turned 41 this year), had a holiday potluck at work. This was her chance to prove to the world that she was "normal". Her options were unlimited! She could bring chocolate oatmeal cookies, peppermint fudge, hot apple cider, or butterscotch brownies. 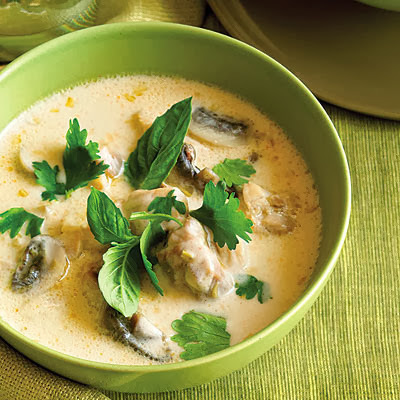 But instead, she brought a crockpot filled with her mom's aromatic and creamy coconut lemongrass soup (tom ka gai). She served about 30 or so little cups filled with this soup - garnished with fresh cilantro - to all of her friends and co-workers. And they thanked her heartily for it. And they came back for more. And oddly enough, it no longer felt strange not to be normal. In fact, it felt kind of awesome. Excellent. Nothing to fear but fear itself.